A musical bow from Brazil. 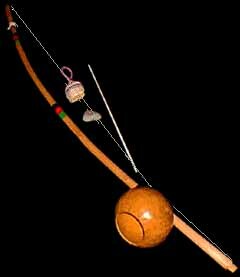 This "bow" is used only for music and made from wood and the string comes from the inside of a car tire. A dried and cleaned out gourd is tied around the string and bow to amplify the sound. The right hand strikes the string with a stick while simultaneously playing a shaker called caxixi. The left hand presses a coin or stone against the string to change the pitch.